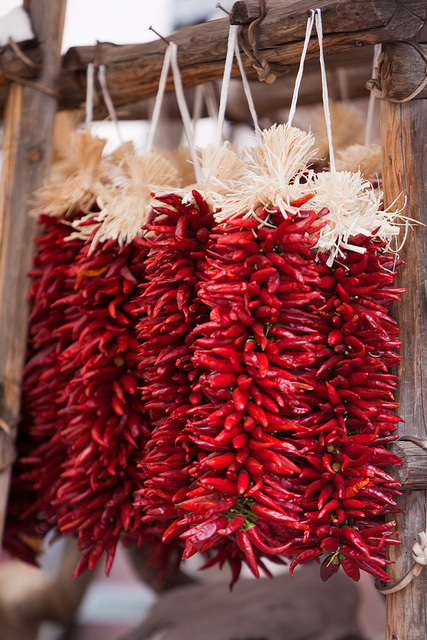 Chile peppers in Santa Fe, New Mexico; photo by tunnelarmr on Flickr (noncommercial use permitted with attribution / share alike). New Mexico designated chile and frijoles (pinto beans) as the official state vegetables in 1965. The legislative debate over adopting a state vegetable centered on the argument that these two vegetables were inseparable, so both the chile and frijole were adopted as New Mexico's official vegetables. Pinto beans are the most widely produced bean in the United States (and one of the most popular). The pinto bean (in Spanish: "frijol pinto," or painted bean) is an important symbol of regional identity in the southwest, especially among Mexican Americans. Native beans were a staple eaten daily by the Indians of the Southwest. 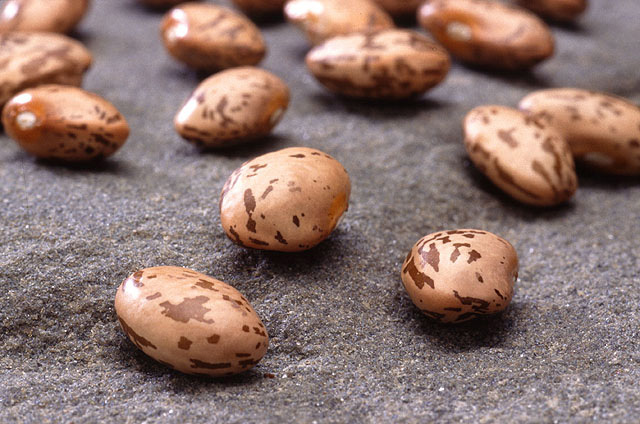 The pinto and lima bean were being cultivated in the Aztec and Inca cultures more than 5,000 years ago. The Old World was familiar with several kinds of beans, but the American common bean* was unknown. New Mexicans use the word "chile" to describe the plant, the pod, and various dishes made with chile peppers (some parts of the country call stew made with beans, tomatos and chile peppers "chili"). Chile peppers (capsicum annum L.) are native to America. Experts believe the chiltepin is the original wild chile (the plant from which all others have evolved). The chiltepin pepper is a tiny round berry slightly larger than a peppercorn. The pinto bean, maize (corn), and squash, have been staples of the Pueblo Indian diet since prehistoric times. Early Spanish settlers brought the chile plant to New Mexico from Mexico, where the Aztecs had been cultivating the plant for centuries. The American common bean (Phaseolus vulgaris) includes all these native beans originating in the Americas: pinto bean,navy bean (so named because they sustained the seafaring branch of the military), red kidney, great northern, marrow, and yellow eye beans. It also includes all our edible-pod garden beans (string-less, snap, & string beans). Pinto beans (frijoles); photo by Scott Bauer / USDA ARS Image Library: Fruits & Veggies.